Your education is an investment in yourself. Depending on the degree you choose, you may earn more than $600 to $800 dollars per week more than you would with just a high school diploma. In terms of your economic future, this means you may make up to $325,000 dollars more in your lifetime with an associate’s degree. With your bachelor’s, you’ll earn anywhere in the range of $800,000 to $2 million more in your lifetime. Central Christian College of Kansas Online wants to help you make that investment - more than 97% of our students receive some form of financial aid. To learn more about how Central Christian College of Kansas can help with paying for your education, visit our financial aid page. Makes tuition affordable and understandable. 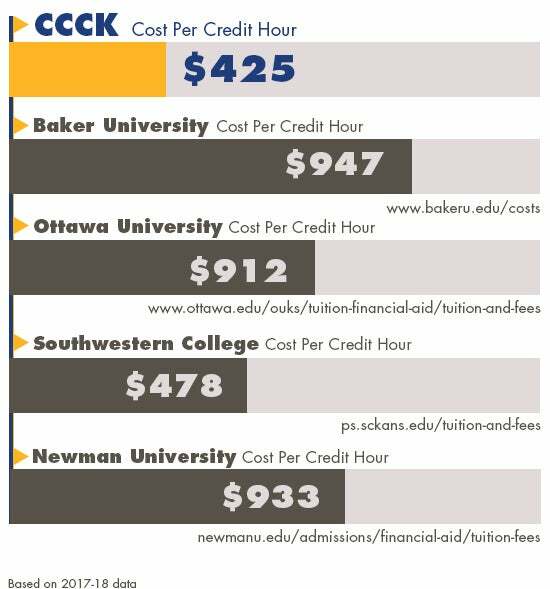 With a competitive tuition of $425 per credit hour across all online programs, Central Christian College of Kansas Online makes its costs transparent and understandable.